Just some Instagram shots from my New York City jaunt last weekend! While my feet recover, let's play a game -- Can you spot Taylor Tomasi Hill, Bill Cunningham and Brad Goreski in the snaps above? Happy Friday everyone! Any plans for the long weekend ahead? 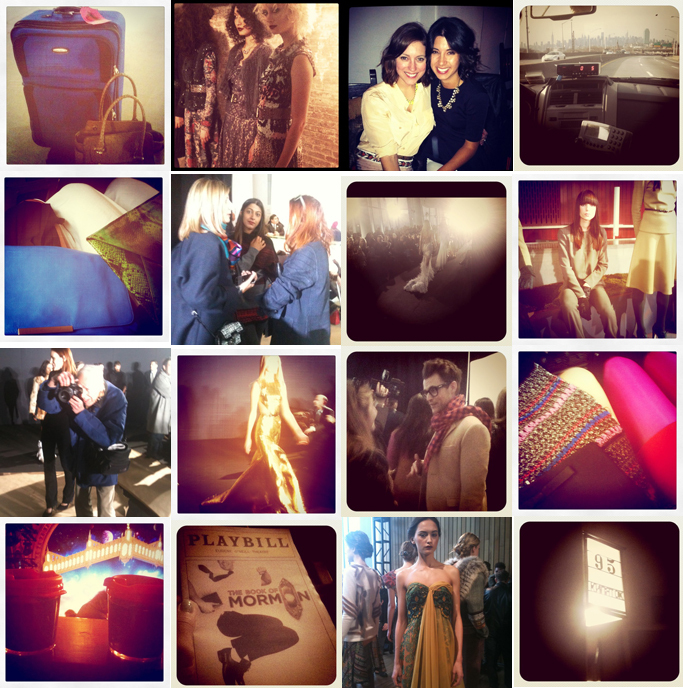 it was so fun following you through your NYFWend via twitter and Instagram. I always enjoy your pics and perspective. Looks like you had an amazing trip! I REALLY need to go last year. What was your favorite thing about NYFW? Have a nice weekend. Fab shots, gives an amazing insight! This looks like so much fun! Thanks for sharing the NYFW with us! loved following you through fashion week! Gosh this looks so fabulous! I just love NYC. Would kill to spend NYFW there just once! So jealous of your adventures! Looks like you had a great trip!! What a trip! So jealous!! Looks like you had tons of fun!